10.02.10 LIVE STYLE MARKETPLACE AND GALLERY EVENT. 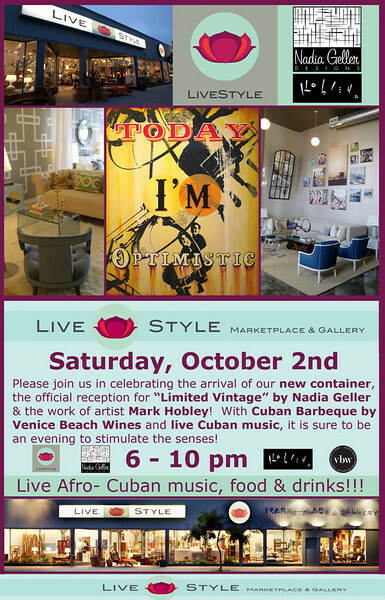 (10.02.10 LIVESTYLE MARKETPLACE AND GALLERY EVENT, Venice, Ca) On Saturday, October 2nd, LiveStyle Marketplace and Gallery hosted the official reception for "Limited Vintage" by Nadia Geller and the work of artist "Mark Hobley." The night was a big hit with the addition of Cuban bbq and free flowing margaritas and sangria by Venice Beach Wines, and live Cuban music. I look forward to attending many more LiveStyle Marketplace and Gallery events. LIVESTYLE MARKETPLACE AND GALLERY. 411 Lincoln Blvd. Venice, Ca 90291. COMPLIMENTS OF LIVESTYLE MARKETPLACE AND GALLERY, GET YOUR FREE DIGITAL PHOTO(S) FROM THIS GALLERY. ENJOY! Note: If you would like to print out your digital files, then double click on the desired large photo on the right and choose the "original" option size. MAKE YOUR NEXT EVENT TRULY MEMORABLE WITH YOUR OWN PERSONAL PAPARAZZI. HIRE VENICE PAPARAZZI TO BE YOUR EVENT PHOTOGRAPHER(S).